The FastJack™ series integrates the high performance of HALO magnetics into industry standard connector designs. 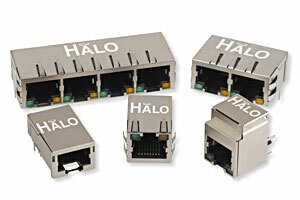 A complete line of Integrated RJ-45 connectors for 10/100BASE-TX Ethernet. The result is an extremely robust, IEEE802.3 compliant solution. The complete FastJack series is UL60950, EN60950 and RoHS compliant. This part requires an NDA to be signed before product details can be received.